We offer monthly memberships, 10-class passes, 1-class passes, and one-to-one classes. Teacher-assisted self-practice (Mysore) classes (1h30m upto 2h) are limited to 10 students. Led counted classes (1h30m)and pranayama & meditation classes (1h) to 16 students. Click on the boxes below to choose your membership or class passes. For details refer to our Terms & Conditions below. All the passes are non-refundable. All monthly passes are memberships, which auto-renew every 30 days. They are for students, committed to a minimum membership of 6 months. We require you to sign up on our Classes page to guarantee your space. If you are unable to sign up online, please contact us and we will assist you. For more information on our reservations and payment system, please refer to My Account page. Auto-renews monthly. Min membership 6 months. Non-refundable. Does not auto-renew. Valid 2 months. Non-refundable. Does not auto-renew. Valid 4 months. Non-refundable. 7 classes. Valid 50 days. Non-refundable. You can attend any of the regular classes with any of your passes. One-to-one classes and workshops/courses are not considered regular classes. All classes should be prepaid, preferably via the online payment system on our Prices page or by cash prior to the class. Monthly memberships passes are designed only for students, committed to a minimum membership of 6 months. Memberships passes automatically renew every 30 days, and record new purchases on the same day every month. A membership will give you a set number of credits to be used within the 30 days following the date of purchase or auto-renewal. When a membership auto-renews, the credits are reset; any unused credits are expired and then replaced by a new set of credits, based on your membership type. You can upgrade or downgrade your membership at any time by contacting us. You can cancel your membership after 6 months by contacting us. Any unused credits remaining on your account at the time of cancellation, will be lost and cannot be refunded or transferred. Memberships are non-refundable and non-transferable. Monthly membership can be put on hold twice per 6 months for a minimum of 1 week and maximum of 2 weeks. Please contact us to arrange this. Membership benefits: annual free passes for family and friends: unlimited members get 10 free passes each year, 15-classes members – 7 free passes and 10-class members – 4 free passes. One pass per guest. Our members also receive discounts for Irina’s workshops: unlimited members 15%, 15-class members 10% and 10-class members 5%. Unlimited members have free access to all Iriness classes including Ashtanga classes, Pranayama & Meditation. One-to-one classes can be purchased by contacting us at info@iriness.com. Price for 1h30 min class is £65. Cancellation policy for one-to-one classes is 24 hours. Sign up and deregistration: you can sign up for a class as long as the calendar on our Classes page shows availability. You can deregister up to 6 hours before the start of the class; after this time a credit will be deducted from your account. If you can’t access the booking system, please contact us and we can remove your registration without you losing a credit. Workshops: for the UK-based guest teachers cancellations made at least 14 calendar days before a workshop will be refunded. Between 13 days and 48 hrs there will be no refund unless we can fill your place before the workshop commences. In this case your fee will be refunded. Should the event be cancelled by Iriness Yoga & Wellbeing, you will be offered a refund or, if you prefer, a credit against future events or regular classes. For the overseas guest teachers the same policy apply with 30 calendar days cancellation policy. We will give a minimum of 1 month notice when changing rates. We do not accept any responsibility for lost, stolen or damaged goods; please look after your belongings. Your contact information will never be provided to any third parties without your prior consent. See full policy here. 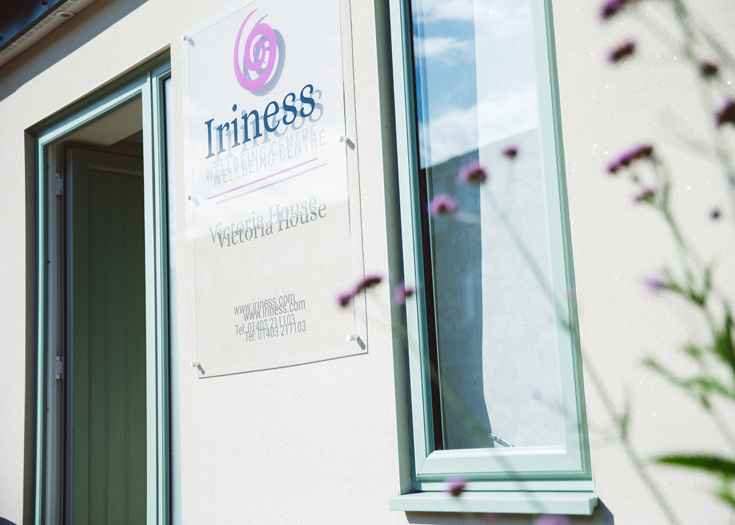 Iriness is the trading name of Yoga & Wellbeing Horsham Ltd.
Our address is Victoria House, Victoria Street, Horsham, West Sussex, RH13 5DZ. Registered company No: 10729888.